A good workout plan is the one that gives you progressive and consistent results. Searching for the best workout plan to help you burn belly fat and build lean muscle can make you nuts. I say this because even though there are fundamental guidelines for the best workout programs, you simply CANNOT take a cookie-cutter approach to getting consistent results. Everyone (every body) is different, as are workout goals, and adjustments must be made along the the way to keep improvement progressive. There are plenty of sites on the Internet that will gladly take your money, and tell you they have the one "secret" workout plan that leaves the others behind. It is all nonsense. We deal in reality, here. A good workout program will focus on three fundamental areas of fitness: a nutritional plan that centers on good food choices, regular workouts that include weight training, and structured cardio that integrates interval training workouts. Although men and women have different exercise goals, it is pretty safe to assume that both want to burn belly fat and both want to put on lean muscle to naturally increase metabolism. In general, women want to look fit, slender, and toned. Men want more definition and greater muscle size. As you can see, even the best workout plan could not be identical. * A solid workout plan will focus first on diet, and educating you about what foods help build lean muscle and what foods are more prone to be stored as fat. * A legitimate workout plan will be sensible. It will NOT push you toward "secret" expensive (and worthless) supplements, harsh diets, or mind-numbing intense weight training/cardio. * It will NOT deal in idiotic hype like "Lose 15 lbs in one week" or "Put 2" on your arms in 20 days." * A solid workout plan will guide you to more conscious eating. You will know exactly what you are putting in your mouth, and you will know what food situations sabotage your goals. * A quality workout plan will emphasize that losing belly fat, or building bigger muscles, are both progressive and require time and effort. Give yourself bench marks like 12 weeks...25 weeks...and 36 weeks to notice positive changes. Although your diet will remain consistent (making even more good food choices as you progress), your weight training and cardio will need adjustments as you gain strength and endurance. * A quality program to burn belly fat and gain lean muscle will focus on fundamental, multi-joint lifts for the weight training phase. * You will be more purposeful in your approach to training at your gym or in your home. You will begin to understand why you are doing certain exercise movements and why there is a need for both intensity and rest. * Your plan will help you understand the benefits of drinking water, and how that aids your fitness goals. * A good workout plan will integrate interval training into your routine as you gain strength and endurance. There should be NO mindless miles of jogging before sunrise. * You will learn how intense 10-second to 60-second bursts, followed by active rest, will help you both increase lean muscle and eliminate belly fat. Seeking a good workout program means you will increasingly become the "expert on you." You will continually be evaluating your progress in 12-15 week chunks. You will have both short-term and long-term goals to keep you motivated. 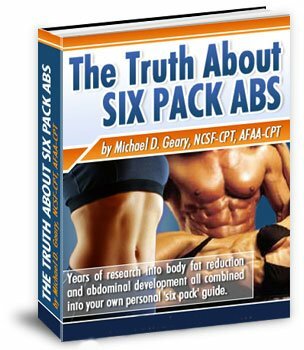 The Truth About Six Pack Abs, by Mike Geary, is the best over-all program we recommend. Although on the surface it appears to focus only on abdominal exercises, you will find out that Mike's program is actually a terrific guide for establishing good food habits and training for increased strength. * This high-profile program has been a best-seller since 2005. In that time, Mike has helped 1000's of men and women get rid of belly fat, lose love handles, and gain lean muscle. * It comes as a digital eBook so that you can download it and start immediately. Mike also offers a 60-day 100% refund guarantee. * Mike has you progress through eight levels of total body exercises and eight levels of ab training. The sessions last a little over 45 minutes. Many do the program in their home with a set of dumbbells. If you are looking for a good workout plan that is sensible, progressive, and gets proven results, The Truth About Six Pack Abs may be exactly what you want.